On August 11, 2018 at the Garland County Library, our next Ham license testing session. You can obtain your ham license or upgrade an existing license. Everyone is welcome. Use the License Testing Info button above for details. 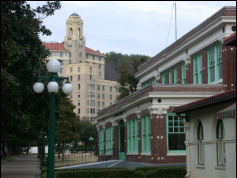 ﻿The Hot Springs Village Ham Radio Club serves the Hot Springs Village and Hot Springs National Park and the surrounding area. Everyone is invited to join us at our weekly breakfast on Thursday at 8:00 AM We hold an open 2 meter net on Tuesday evening at 7:00 PM. Please feel free to join us if you are in the area. For additional detail click here. We are an American Radio Relay League (ARRL) affiliated Amateur Radio Club (ARC). 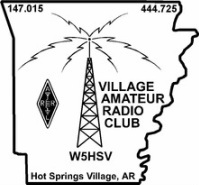 You can also click on the picture and logos above for more information about Hot Springs Village, Hot Springs Nataional Park, our club and the ARRL.